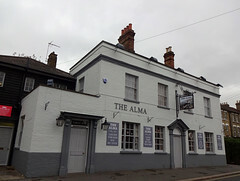 Pub in Sidcup, fairly near the station. The interior was clearly once divided into two parts, but today there's free passage between the two sides. Decor is traditional but uncluttered, with a patterned carpet on the floor, wood-panelled walls, a pale wood bar with a line of stools and a brass rail for resting one's feet, and comfortable beige pleather banquettes around the edges of the room. Daylight trickles in through dimpled-glass windows flanked by tastefully-embroidered curtains with matching holdbacks. Kake visited on a Tuesday afternoon in October 2018. There were a handful of other customers in when I arrived a little after 1pm, all apparently regulars. Music was playing quietly. The two handpumps on the bar were clipped for Sharp's Doom Bar and Adnams Ghost Ship. A pot of tea was £1.50, beautifully served on a little tray with an elegant little milk jug and a blue-and-white china cup and saucer. Lunches are served weekdays, according to the 2009 Good Beer Guide. There was a menu on the bar on our October 2018 visit, but we didn't get around to having a look at it. According to signs seen in October 2018, they don't take debit or credit cards, and dogs are not permitted. Accessibility: A small step to get in, no more than an inch or so. A step to the toilets. Last visited by Kake, October 2018. Opening hours taken from WhatPub, November 2018. Last edited 2018-11-01 11:46:53 (version 9; diff). List all versions. Page last edited 2018-11-01 11:46:53 (version 9).